On the West Coast you have the Beverly Hills “Golden Triangle” with Rodeo Drive running through it. Across the Pacific Ocean, on Hawaii’s largest and geologically youngest island, you can find the Kohala Coast, also known as the “Gold Coast”. You may not find extensive high-end shopping there, but you can find an active, luxurious lifestyle that is defined first and foremost by its sun-drenched climate, tempered by soothing, tranquil trade winds. With temperatures that vary only slightly between 70-85 degrees the Gold Coast has only 8 inches of rain all year, on average. The ideal climate here has inspired international developers and architects to design homes and planned resort communities that fully integrate indoor and outdoor living. Often, interior design and lush landscape design become a continuum. With its controlled growth and low density, it may be said that wide open space itself, is a major part of the luxury lifestyle on the Big Island’s Gold Coast. Variety also means choices for vacation home buyers. Each of the major resort communities on the Kohala Coast represents distinct lifestyle options. For example, Kukio is the only private equity Golf and Beach Club on Hawaii's Big Island. Carrie Nicholson says, “Members rave about Kukio's signature Outdoor Pursuits program and the two Tom Fazio designed golf courses (10 hole and 18 hole)”. Rob Kildow, who represents Hualalai Resort properties (located adjacent to Kukio), notes that, “the club not only has extensive lifestyle amenities, it also has a AAA Five Diamond hotel, run by the Four Seasons”. Playing golf and tennis is not the only way to stay active here “Surfing, stand-up paddling, zip lining, motor cycling, hiking in the rain forests, studying volcanoes and even snow boarding at 14,000 feet elevation are all close by”, states Brodie Callender. “Diving and snorkeling in warm water among the pristine coral reef of Kohala’s costal coves is an amazing experience”, says Yvonne Knouri-Morgan. “Because there is so little rain here there is less soil run-off which means the underwater views are crystal clear and the coral is untarnished”. Some homeowners who live in the Kohala Coast planned communities never feel the need to leave because their every need is attended to right there. “The amenities are plentiful in the major resort communities and the service is impeccable. People feel safe there. Venturing out is really a matter of preference, says Brandon Wood. For those who seek more privacy or “climate control” Kohala Ranch, further up the coast, may just be the ticket. “This gated community on more than 3500 acres, has a range of elevations between 120 to 3000 feet above sea level. It has varied climates and terrain. Although, there are no oceanfront properties here, all homes in Kohala Ranch have panoramic mountain and Pacific Ocean views”, says Harold Clarke. 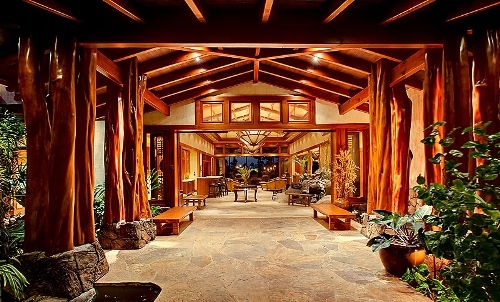 Steve Hurwitz adds, “Kohala Ranch affords its home owners more privacy. The amenities of the resorts are not typically a priority for these residents, who tend to live there year-round”. When you can say that your environment and your lifestyle are "just right" that is true luxury.